The differences between concrete and asphalt. How to maintain and care for both types of driveways. The important issues that need to be considered before making a decision on your driveway. So you’re in the market for a new driveway or perhaps you’re building a new home and need to decide how to pave your driveway. Either way, you’ll probably have two traditional options to choose from- concrete or asphalt. They are similar but have key differences you should consider before making a decision. These considerations include aesthetics, climate, maintenance, cost, and restrictions. Both concrete and asphalt must have well compacted bases of gravel before application. Both take time to ‘cure’ before they can be driven on, although concrete takes several days while asphalt takes several hours. In addition, both are made from the same general material- stone and sand. However, the difference comes from the adhesive. In asphalt the adhesive is tar and in concrete its cement. These two substrates give asphalt and concrete their unique characteristics. They also affect costs, durability and maintenance. Tar, while more inexpensive than cement is softer and degrades easier and faster. However, with proper maintenance this negative attribute of asphalt can be diminished. As they say, beauty is in the eye of the beholder. This is true for driveways as well. Some people like the look and concept of the driveway being an extension of the road and therefore have asphalt driveways. The differences between asphalt and concrete are as different as black and white, literally. However, there are some different things that can be done to both asphalt and concrete to get away from the traditional black or off-white colors. As a general rule of thumb, concrete is an easier material to work with to get different finishes. Concrete can be stained or tinted to an array of colors and can be stained differently in a single driveway to get unique patterns. Concrete can also be stamped into different designs, etched or engraved to get different looks and it can have different finishes such as brushed or exposed aggregate. All these different options can create a plethora of unique options when designing your driveway. Asphalt is more limited. 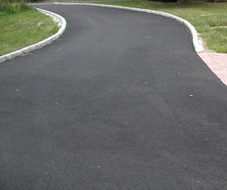 Since asphalt must be rolled and compressed, there is little in the way of unique finishes. Moreover, until recently, there was little option in color apart from standard black. However, there are now tints that can be added at the end of as a sealant or even integral coloring that is added during mixing. Cost $2.50 - $4.00 /sq.ft. $4.00 - $6.00+ /sq. ft.
For those who live in areas that have either very cold winters or very warm summers, climate can be an important consideration. Concrete has the tendency to crack and suffer from frost heaving in cold and freezing winters. Furthermore, salt used for ice melting can create pits in concrete leaving blotches across the driveway. Alternatively, asphalt has issues in hotter climates. The tar in asphalt can become soft in the high heat of summer and can become tacky and even deform in some cases. It is important to talk to a reputable contractor about the effects the local climate will have on both asphalt and concrete prior to finalizing any decisions. There are definite differences when considering maintenance. After about six months to a year after installation, asphalt driveways should be sealed. Asphalt should then be subsequently sealed every three-five years afterwards. This can be done by anyone and does not require any special tools or machinery. Sealing the asphalt will extend the life of the driveway, which when properly maintained may last upwards of 30 years. Both asphalt and concrete driveway cracks can be repaired. However, asphalt cracks are easier to repair and blend into the original. Meanwhile, concrete repairs are more obvious due to weathering. An added plus with asphalt is that it can be resurfaced fairly inexpensively leaving a brand new top coat if the old layer falls into disrepair, which is impossible for concrete. Ignoring any maintenance costs, asphalt is generally much cheaper to install than concrete. On average, the cost per square foot for asphalt will run between $2.50 to $4.00. Fluctuations in crude oil prices can cause fluctuations in asphalt prices but the price will remain around this range. Concrete, on the other hand, can run between $4.00 to $6.00 per square foot for basic installation and can cost more depending on different finishes and detail. 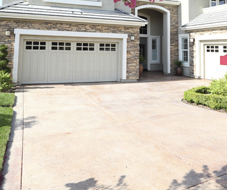 It’s not unheard of to have a stained concrete driveway with a smooth finish cost over $15.00 per square foot. Finally, before you get too far, you may want to check with any local building codes to see if there are any specifications. For those that live in a development, your HOA may have very specific restrictions on color, finish or even type of driveway material you can use.